Sandman Slim is back from Hell. 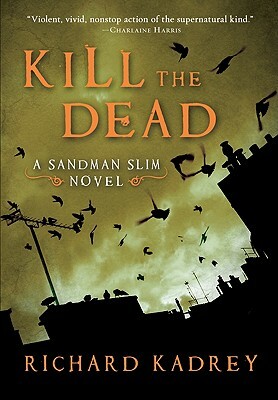 After wreaking unholy havoc in author Richard Kadrey’s resoundingly acclaimed Sandman Slim, the demon-slaying anti-hero and half-angel fugitive from the underworld returns in a brutally funny, eye-poppingly inventive, and totally addicting follow-up, Kill the Dead. If you’re a fan of Buffy and Jim Butcher, Christopher Moore, Neil Gaiman, and Warren Ellis, or you dig the dark urban fantasy vibe of Charlaine Harris, Kim Harrison, and Simon Green, you’ll cheer Lucifer’s onetime personal assassin as he signs on as his ex-boss’ Hollywood bodyguard…and takes on the zombie apocalypse almost single-handedly.